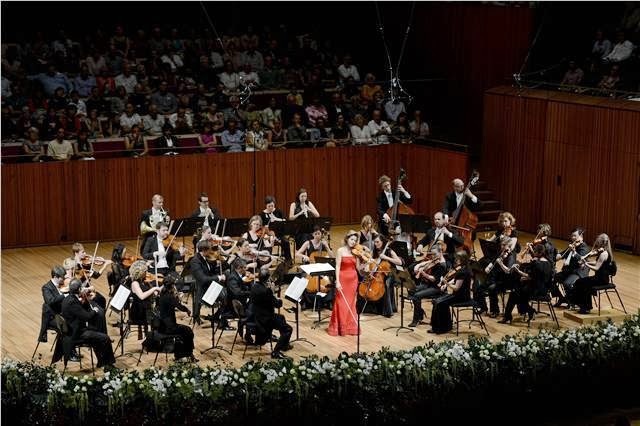 Anne-Sophie Mutter made her second visit to Sydney last week an opportunity to celebrate the Mozart Violin Concertos 2, 3 and 5 and give the orchestra the privilege of working sans chef. Is this every orchestra players dream? It was a brilliant success and credit is deserved all round - to her glorious self, to the orchestra alone with themselves, and to W.A.M. - for an especially sophisticated evening of music. She looked stunning, it always has to be said, and her musicianship with the violin is arguably unparalleled. Her interaction with the orchestra showed a mutual respect of which we should be quite proud. They excelled themselves and the sound from mid stalls (where one sits for music of this genre not to mention Ms Mutter) was most beautiful. When she had the opportunity, and whenever she felt it necessary, with her lovely arm she would sweep through the melody, encourage this section here, over there now, and occasionally, in the only corrective stance, reign in the dynamics a bit. "elegant, reflecting the French influence, including the Rondeau finale ... more conventional in every sense compared with the last three." "Alfred Einstein was right to describe the Adagio of K216 as seeming to have fallen straight from heaven - the effect of muted strings was quite new, and gives the entire movement a magical atmosphere, and the Rondeau is much more daring then previous ones. What's more. there's now an equal dialogue bewteen the violin and orchestra, as opposed to the first two concertos, where it's merely a partner in the back-ground. Here Mozart has achieved the ideal shape of the violin concerto." "the crowning achievement is K219 because here Mozart experiments with many new ideas. That is the most daring and multi-layered concerto, full of abrupt emotional changes." Here she is in a promotional video from the SSO, with some lovely things to say about the orchestra, about Mozart, and particularly about advice to young musicians. It is not that one should try to be a star, one should strive to be a good person. And happily, she speaks of next time. The question to contemplate as I walk the woods is the relationship between goodness of person and fine musicianship, and vice versa. Ah, lucky you! The video was wonderful. She really is the "whole package," isn't she? I was given her first LP recording in 1980 in KL on my first trip to Sydney by the ex-DGG German wife of a colleague there. I think Mutter was 14 and the works were the 3rd and 5th concertos - with BPO/Karajan. Still greatly treasured (in spite of my more recent conversion to HIP performance). I see that David Nice is one of your visitors. That's good!